My name is Vaughn Prentiss and my whole life was a lie. I’d had one goal--prove that an orphan from Baltimore could become the youngest partner at my law firm. That all changed the day I started seeing monsters. Nobody else noticed these mami watas, zwarts and other demon spawn. With the help of a former witch, I discovered Lucifer was my uncle and that a prophecy foretold I’d bring about his downfall. Unless he killed me and took my soul. I have a lot to live for and I don’t like the idea of Lucifer using my soul to bring humanity to its knees. 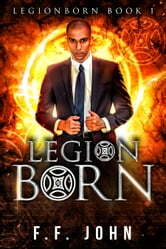 My name is Vaughn Prentiss and I’m going to fight to take my place as LegionBorn. Lucifer has no idea what’s in store for him.